Cranes are being left sitting unused in yards all around New Zealand despite a mountain of work as the industry struggles to find enough people to operate them. 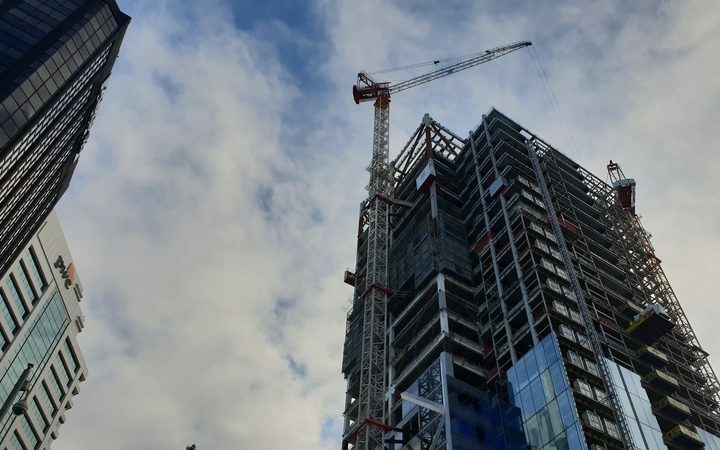 A record number of cranes tower over Auckland’s skyline marking major developments in the midst of the country’s building boom. Rider Levett Bucknall publishes a quarterly crane index for the country. In its most recent report in September it found a record 140 long-term cranes across New Zealand’s skyline – 90 of which were in Auckland. And for every tower crane on the horizon, 10 smaller mobile cranes are working around them. Crane Association chief executive Rod Auton said the problem was finding people to operate them. It meant cranes were being left unused or work was having to be extended until a person could be found to do the job, he said. Mr Auton said the obvious solution would be to bring in people from overseas, however, that was a lengthy process. “Crane operators aren’t actually recognized as a qualified profession or job and the ANZSCO [Australian and New Zealand Standard Classification of Occupations] system, which is the basis in which Immigration put people on the shortage list. “They’re not high enough up the list to be put on the short list so they’ve got to be brought in on a one-on-one basis and that process can take some time. In the meantime, he said they were working on boosting qualifications for the profession. Auckland and Waikato Cranes chief executive Philip Gedye said if he had another 12 people he could put them to work straight away. “We’re definitely very affected by the shortage of skilled people familiar with high-hazard operations. Crane operators, truck drivers, riggers, dogman, all those sorts of people are in heavy demand and short supply. He said it meant illness or absence had a knock-on effect that meant people doing longer shifts. “We’re trying various recruitment and training things to take people we’ve got and make them more multi-skilled [and] to seek to get new people in whether that be younger trainees or even people who have retired. He too pointed to the difficulty bringing in workers from overseas. In the absence of skilled offshore staff, he said some in the industry were cutting corners when it came to recruitment. “We have observed some behaviors and practices around the industry that are less than ideal or symptomatic. However, Smith Crane and Construction managing director Tim Smith was not feeling the pressure and said the construction boom had meant his company could expand. He had no problems finding people to operate them. “We’ve got a good loyal crew of staff and we’ve supplemented that with quite a few Filipino immigrants coming in who have proved really reliable and very good at what they do,” Mr Smith said. That was in part due to being an Immigration New Zealand-accredited employer, which meant it was easier to hire workers form abroad.